Speaking of parties, I think we’re going to throw a little get together tomorrow evening. Aldwyn feels like DJing again in SL so we’ll probably just be out in our park again, or maybe up in the fun skybox to play Greedy or trivia. We haven’t really decided. Much to do before tonight, so I’m off! Day 46 – The Denimore-Otoro Wedding! 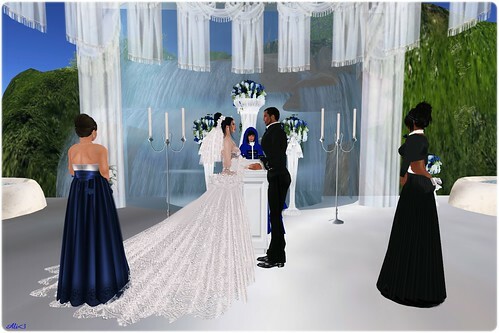 My friends Lourdes and Salvatore got married today!! I was their DJ, so I took extra special care to dress nicely. It was a great place and it was really nice to see some of my plurk buddies in world! We so rarely get together. Well, okay, I so rarely get together with them. I’m sure a lot of them see each other all the time. But of course, nothing was better than seeing the bride walk down the aisle. LOOK AT THAT DRESS!! Awww, the bride and groom!! We had a really great time at the reception. They requested a pretty much all 90s playlist, which of course you know I was totally into. I love 90s music!! And yes, we did take our shoes off! Kesseret really enjoyed the reception! She did share, though, so that was a plus! It was really an awesome wedding and I’m overjoyed that I got to be part of their day. 🙂 Now who is NEXT??? Day 300 – In the home stretch! Well well well. Number 300 in the 365 photo challenge. Of course, had I not been postponed a few days here and there, I guess I’d be closer to 315 or so. But I told myself that when I started, if I had to miss a day, I’d pick it up and not skip. So there you go. 300. So what changes will come this September? Who knows? I already feel some “shifts” in my SLife. Good ones, I think. I hope, anyway! So I learned 3 things today. 1. When I’m using my male shape and I happen to go out shopping, I really should consider investing in a male AO so that I don’t bounce around and walk girly all over the place. 2. I need to warn people before they come into my house that I have it set so I see the sun & moon only, not local lights. I don’t know how I got into that habit, but honestly, it just LOOKS better to me because I usually have my windlight setting on a bright light. But, I really didn’t realize that anyone who has it set to show local lights who might come into my house will be blinded immediately. That’s one of the new Isolde skins by Exodi, btw. I think it’s the Gacha gift makeup one, or the fishing gift one. I’m not in world at the moment to check. I didn’t have time to really tweak my face for it, so if it looks strange on me…well, I look strange in most skins other than Belleza these days. LOL It’s not the skin’s fault, it’s my crazy faced shape. I’m always really happy when I find just the right thing for the house. I’ve been attempting to finish the living room, but I had a blank wall that I just didn’t know what to do with. 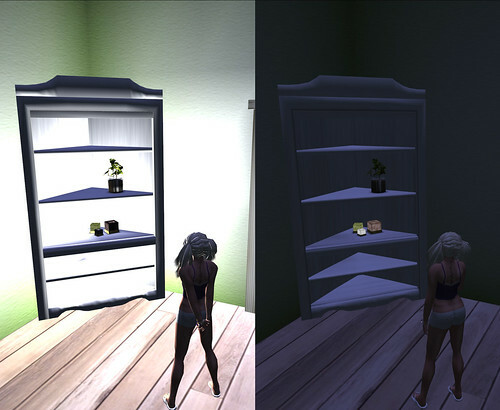 I hit up Kyoot for Fifty Linden Friday, thinking their memory tree was small for a tabletop. I was so excited that it was wall sized! And perfect for the house! I rarely take photos in world anymore, so I’m digging through my flickr to find good pics to upload for the tree. I love it. 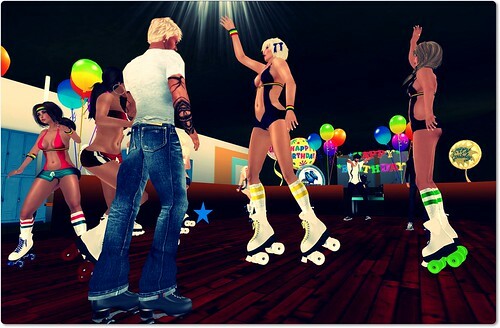 This evening I came out of my semi-retirement and DJed a birthday party for Bethany Heart. I say semi-retirement, but really, I just have just been too lazy to DJ. LOL It was really fun, and the party was full of the cutest little roller girls ever.